"Пётр и Патрик" : No more animal testing for toxic cigarettes! защита природы защита природы - No more animal testing for toxic cigarettes! Против испытаний на животных токсичных сигарет! 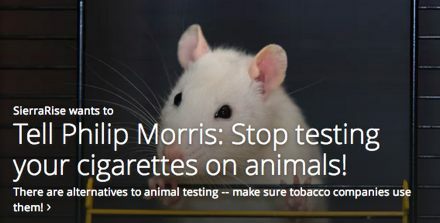 RICHMOND, Va. (AP) — The nation's third-biggest tobacco company says it's banning animal testing following discussions with an animal rights group. Lorillard Inc. confirmed the policy change to The Associated Press on Monday. The Greensboro, N.C.,-based maker of Newport cigarettes says it won't conduct or commission animal research unless it's necessary to meet regulatory requirements. Lorillard also says it hasn't done any animal testing in about three years. People for the Ethical Treatment of Animals says it has shareholder proposals pending with Reynolds American Inc. and Philip Morris International Inc. and that it's talking with Richmond-based Altria Group Inc., owner of the nation's biggest tobacco company, Philip Morris USA. PETA cites industry studies in which animals were forced to inhale cigarette smoke, eat tobacco and have cigarette tar painted on their skin. They test cigarettes on animals! ?